It’s been a long time since I’ve posted any product reviews, and part of the reason for that is I haven’t been inspired by many products lately. I’ve seen some good ones, but nothing that struck me as being a “game changer”. It’s called DynamicVSL, and was created by an Internet marketer named Rob Jones. 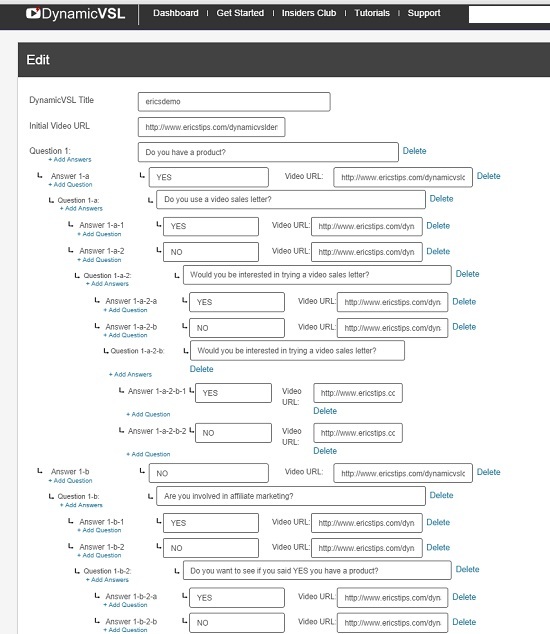 In a nutshell, it’s a tool designed to create interactive sales videos. You could ask my business partners Paul and Jeff… I’ve been talking for years about wanting to create an interactive sales video. The way I always described it was like a “choose your own adventure” book. In the past I’ve found some solutions that would do part of what I wanted to do, but never all of it. For example, using Camtasia I can create hyperlinked hotspots in videos, and use them to skip to other parts of the video, or to a link. Using that feature, I could create an interactive video, but it wouldn’t work for a video sales letter (VSL), because it only works if I export the video with Camtasia’s player. If I export a plain MP4, those interactive elements will disappear when I drop the video into a VSL video skin with no controls. Back in the day, I could use shockwave flash (SWF) to create an interactive video (such as what was used for all sorts of SWF-based games), but that format is no longer supported for video. The last option would be to have a program custom-coded to make the video player do what I wanted to do. I guess the reason I never did it is because I was waiting for someone else to do it, and finally they have. As you may know, I’ve been using VSL’s for most of my products for the past few years. They typically convert much better than written sales copy, and part of the reason for that is the audio-visual element. It’s inherently more engaging than a static sales page. But what if you could take that engagement to the next level and interact with your prospects through the video, similar to how a salesperson would sell to a prospect in real life? That’s the premise of DynamicVSL. It enables you to customize the sales video to tailor the message to certain segments of your audience. I’ve been waiting to do this, and I plan to implement it immediately. In a traditional VSL, the best option is typically to choose the ONE most-important market segment (your archetype customer) and gear the message toward those people. You can attempt to widen the net by appealing to multiple groups, and I’ve done that to some extent (effectively appealing to two groups), but it’s difficult to do that without compromising your primary objective. If you spend much time appealing to various segments, you’re wasting the time and losing the attention of the most important segment. And while you may be able to somewhat effectively appeal to a couple of groups within one video, it becomes exponentially more difficult to add more segments, such as the four in the example above. But with DynamicVSL, there’s no limit to the number of sub-segments you can drill down into. First I created a short PowerPoint presentation with a total of 13 slides. To go along with that, I created a brief outline in Notepad with the questions I wanted to ask, and the possible answers. For this example, I kept it simple with YES/NO answers, but you can have multiple choice and more detailed options. Next I recorded 10 very short screen capture videos using Camtasia. You don’t have to use Camtasia, it’s just what I like and use. Rob actually prefers Screencast-O-Matic, which is only $15 compared to $299 for Camtasia. You can use DynamicVSL with any MP4 videos, doesn’t matter where they come from. I exported those 10 short clips as MP4s, and uploaded them into a folder on my website. 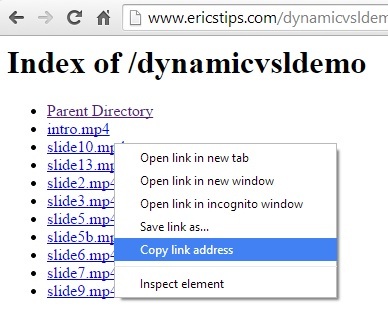 This made it easy for me to copy and paste the URL of each video into the DynamicVSL interface. If I were setting up a VSL for a major product launch, I’d host the videos on Amazon S3 and it works just the same way. All you need is the URL of each video. It’s definitely more work than setting up just a simple VSL, but the ability to customize the experience makes it well worth it for me. I expect it will increase conversions significantly in most cases. Lastly, I simply grabbed a snippet of code that was generated by the DynamicVSL program, and pasted it into this blog post to embed my dynamic video. If this were an actual VSL, I would have selected the “autoplay” option. But since this is a blog post, I elected for you to press play. As you may have noticed from my example above, there are other uses for DynamicVSL beyond creating sales videos! It can also be used for affiliate promotions, squeeze page videos, educational videos, and other “choose your own adventure” experiences. Let’s say you’re sending traffic to a landing page which promotes a product as an affiliate. Instead of wasting the percentage of traffic that isn’t interested in that one particular product, you can use the DynamicVSL method to find out what they are most interested in, and sell it to them! The program is currently in “Beta” mode (which means you can join at a discounted price), but as you can see from my example it is fully functional. Rob is actively taking feedback every day and has plans to continue to improve the program. I look forward to see what new innovations he will integrate. I tried the demo video you made and it actually hung on the 3rd slide. The question and and choice buttons did not appear. And when I clicked on the video, it kept playing the 3rd slide segment over and over again. It could be an issue with the browser, Chrome. You may want to feedback this to Rob. Thanks, I will check into it and will let Rob know! He has been very responsive and quickly fixing things. The third slide is not producing a Yes or No for to click. I waited some time but it didn’t appear. I also got hung up when I returned to answer in the affirmative – having initially answered in the negative. Great demo Eric, you certainly have a polished presentation style and it is also good to see you promoting a useful product mate! After 2 ‘NO’ answers, the video froze and never presented the third answer opportunity. Yes answers do not produce the glitch. Eric, I am currently into Network Marketing and 2 Companies I am representing right now. My plans are to increase my Income Streams and add 3 additional Companies. I am staying strictly with 1 Brand Opportunities that have different levels of participation. Do you think the Dynamic VSL Tool could be used successfully to market these opportunities? Not sucking up here, but I put tremendous value in your opinions and recommendations, so am looking for honest opinion and how this tool could be used in this segment. I think the Dynamic VSL can be helpful for virtually any application in which you are using a video for sales or persuasion. In your case, you’re recruiting network marketers. In a video, you may want to identify what kind of marketer you’re talking to. Are they a newbie, an experienced network marketer, etc? Maybe you want to find out if they’ve had bad experience with MLM in the past, and what other ones they’re involved with. All of those answers can help you custom tailor the message to that person. as I’m not much for subscriptions…BUT…maybe in this case I’ll make an exception. Thanks, and I agree 🙂 I’ll let him know. Great idea Eric… The only problem is I looked at this page with my nexus 4 and there’s a big hole where your video is supposed to be. Maybe this would not happen if you go with the YouTube option? Note if you are on a mobile device you might not see the video above. In the program, there is a place to put an alternate mobile video which will be seen by mobile users to ensure that 100% of your visitors see a video. However for this demo I simply did not take the time to do that. I appreciate the video and it looks like a great tool. However….. I think your slides are a little mixed up. You asked if I had a product, I clicked yes and you said. 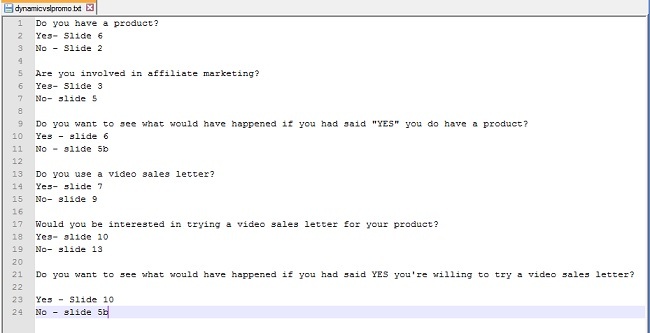 Great you’re an Affiliate marketer. Just thought you ought to know. Thanks Eddy, I will look into it. I was doing some experimentation and I think you may have caught it in the middle of an edit. Thanks for the heads up on Dynamic VSL. It looks a good piece of kit. However, when I clicked on your video demo I got nothing. It just froze completely. I guess I’ll wait until any bugs are fixed. I’m using Firefox and Windows XP. I’m using Seamonkey and the video is blank. I’m not familiar with seamonkey. my guess is that the program might be interpreting it as a mobile browser, therefore no video is showing because I did not designate a mobile video URL. I just tried it again and it’s working ok now. I think Seamonkey is a variant on the Mozilla/Firefox thing, so shouldn’t be much different anyway. Your “yes or no” Answers are not working, when you get to the 3rd Question of saying yes or no. It seems pretty useful. I think direct influence, by the prospect, is a great idea. In my opinion, the longer you can get a person to engage with your message, the more likely he/she is to buy in the end. This looks really good, however, I hate subscription payments and that would be the reason I wouldn’t purchase it. Looks good though and should help increase the sales of anyone who uses it correctly. I can see why you are excited by this advance in technology. What do you think of using a live video chat room as a follow up for Q & A? Thanks for the info…..BUT I only need to receive it once. I have been asking you for several months to get your autoresponder sorted. You send me FOUR copies of the same mailing on each occasion. Please sort or I unsubscribe. Final request. Thanks for the review, you always do good for us peeps. BTW; (look out for the snakes in Masonville) lol ..been there done that..lived there for a while and used to catch them on my front lawn!! Thanks for the write up! This looks like it could be really useful. A couple of things really bother me, if you can pass them along that would be great. 3. On the sales page, you can only view the video, there is no text description. I realize that the whole point is you are producing video. But a text description along with an idea of how long the video is gives me the information to decide whether to incur the cost of viewing it. When I lived in the city I never worried about such things. But I have spent quite a bit of time in recent years outside of the US and now live in a rural area, and it has really brought home to me how different the experience is on the outer edge of the internet. I will pass along your comments. If this were primarily a tool for educational video, or really any video application other than VSL’s your concerns would be paramount. But in the case of VSL’s, this tool is basically using the formula that works best right now… no controls, no time counter. You could always add text on your page with the video. For example, if you want your audience to know it’s a short video, you could write below the video: “Please watch this video now, it’s only 7 minutes long!”. I live in a rural area too, and access Internet through wireless towers, but luckily it’s not metered. But my house in Louisiana has really slow internet, too slow for much video streaming. But one thing to keep in mind, if you’re using a VSL then ultimately you are targeting people who have broadband and are not worried about the bandwidth. Although you may be alienating a portion of your audience in rural areas and those with dial-up, the premise is that the increased conversion rate more than makes up for it. Oh, I think you’re right! Well my review pretty much sums up the product in a nutshell. So she probably wouldn’t need to watch the video unless she is seriously considering buying it. hey I am learning… good luck this new experimentation using videos. The more I read and pay attention… I how I am closer because my understaning is expanding. God bless! And thanks! Please keep sending your info. The only problem I have with this software are the monthly recurring fees. There is no particular reason the software could not be sold as a one-time product and run on a website. I have to question the motivation of the developer on this product. Since it may be the only product of this type out there at the moment, with no competition, the developer may be able to get away with monthly charges. (Up to 120 months if you notice the terms on the order page). The obvious advantage of having a unique product on the market is that you can just about charge anything you want. As consumers, let’s hope that other developers will take notice, and produce a more reasonably priced one-time cost software product that can do the same thing as this software does. For big-time marketers, making thousands per month, this may be an acceptable cost, but as for myself at this point, I need to reduce my monthly recurring expenses as much as possible. It is simply not worth $ 564.00 per year on a recurring year after year basis. If you feel it is worth it for you and you can afford it, then by all means, go for it! You are certainly far from alone in your sentiment about recurring fees. I’ve heard that from several people. I don’t know anyone who likes monthly charges to their credit card. But it’s a part of the nature of this business… things like web hosting, autoresponders,etc. Maybe Rob would be willing to make a one-time deal. Anyway I wouldn’t question his motives in regard to the payment strategy, I know he’s been working around the clock supporting his customers and is also employing a developer with a plan to keep making the product better. Also, it’s only a matter of time until someone else will come out with a knock-off cheaper version and sell it for a one-time fee. So he has motivation to keep making it better to stay ahead of the competition, and support it well to make it worth the investment. Well, I just bought it – AND – I absolutely detest recurring payments. I almost didn’t buy because of the maximum 120 payments at max of $47 month- I took this to mean it is only gteed at this price for beta takers for 10 yrs. We can cancel at any time, via our membership and also via paypal – so there is no risk. I know after studying average of 60-80 hrs a week online for 3 yrs, and working on 9 sites – that within a few months someone else will copy this – and will offer once off price – then I will compare this. Until then the opportunity to make massive improvement in my bottom line, particularly in my online course/training sites is unparalleled – and of course Eric’s recommendation and post about it makes it a no brainer. In fact I trust Eric’s recommendation over any Guru I follow ( several hundred over 3 yrs). I have never heard of Rob Jones, without getting this email from Eric and then seeing endorsement from the likes of John Carlson, I would not have bought it – basically there are the same things that others mentioned like video length etc but you can compensate for that – same as you do with most everything IM related. But this is as customised as it gets for now, so instead of 100 vsl’s per niche I figure I can get away with 10-12 with this program and that is a game changer, and I would have to have rocks in my head to not buy it to maximise my bottom line, never mind my time and energy. Keen to have a go ! I’ve already looked into marketing this product and I have a few questions. 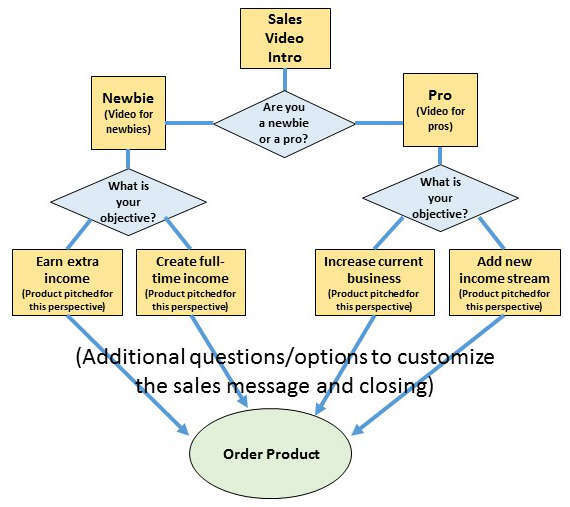 I would like to make a short vid demonstrating how this product works – short enough to invite prospects to watch it twice and choose alternative options on the second go around to witness the different answers. I’m wondering whether I can incorporate Easy Sketch Pro (a doodle software) and this Dynamicvsl together so some slides are static and others are moving with doodle slides? Hope I’m making myself clear. Secondly – the OTO. Do you know anything about it and if so – is it worth it? Yes that would work! You can use any MP4 video, so that could be a static screen capture, a sketch video, a live action video… anything really. Each segment is its own MP4 file, so you can mix and match as much as you want. I’m not sure if he’s added it yet, but he’s also planning on adding functionality to use Youtube videos. The upsell is for Rob’s insider club, and I haven’t evaluated it. As always, my recommendation is to only buy things that you will actually use, so it may or may not be a right fit for your business. I can tell you for sure that the product works just fine without the upsell. Thanks Eric – I’ll be purchasing today from your link. Hopefully it’s still up. Once again, on the fence… buy button was clicked, info filled out… and then I decided to type this..
We do not control when your email arrives from an Aweber mailing. Sometimes mailings are spread out over many hours. Of course, we are thankful for all who have made sacrifices for freedom. I’m guessing he would be a full-time artist!